Apparently, some Drillers don’t plan for mistakes. This is not good! For some reason, some Drillers are taught that they’re not supposed to pick up their piece of equipment (rifle, saber/sword, guidon) when they are dropped even when performing i a competition! 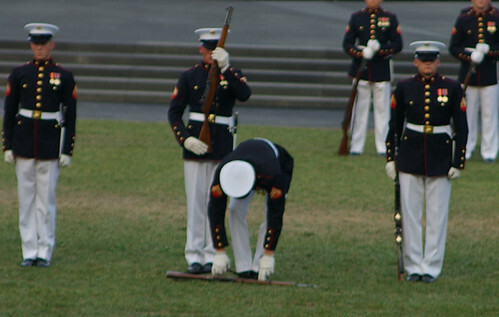 Unless you are part of the Marine Corps’ Silent Drill Platoon (see picture at right borrowed from Flickster), this is silly! What is worse is a Driller saluting their rifle before picking it up! Stop it! I understand the reasoning behind this: The service honor guard drill teams do this (mostly the SDP, now) and this is an example to follow. OK. Got it. Now, stop following this guidance. It works for the SDP because of the type of show they put on; their performance is one of top-notch perfection with zero confusion and a single focus point throughout the majority of their routine. The commander of the drill team or the sergeant who is in charge at any point during the routine, are the ones who move to break ranks and fix whatever needs to be fixed. That’s the SDP way and it works well. Below is a picture of the changing of the guard at the San Yat-Sen Memorial Hall in Taiwan. Drops happen and when they do, other guards in civilian clothing pick up the rifle. Oh no, a drop! How about we have the whole team stop what the routine so that the commander can walk over and pick up the rifle and hand it back to the team member. *This is an embarrassing situation for the driller and also for the audience. There is absolutely no need for this kind of action. If you use this in training, it should never see the light of day in a public performance. Do these scenarios sound like the best use of time? No. Do they add to the flow of the routine? No. Both of these scenarios detract from completely performance and offer nothing but confusion to the audience. The eye is always going to follow what is moving or what is moving faster. This is something to keep in mind when a piece of equipment is dropped. In a situation where a piece of equipment is dropped it should be taken care of as quickly as possible so as to not draw attention to the problem and keep the focus on the routine. What does a Driller do when a drop or hit occurs? First, a drop is where the rifle completely leaves the hands and rests on the ground. A hit is where the rifle leaves the hands and may hit or brush the ground or the body but is still recovered. You could say that a hit is more like a fumbling. A driller needs to take care of the drop or the hit as quickly as possible. In the case of a drop including it into your routine; having the audience wonder whether it was part of your routine or not, is the best way to recover from a drop. So, what a driller needs to do is practice recovering with style from a drop. There are several different ways one can do this it just depends on where the rifle is in relation to your body. Laying the rifle down on the ground at different points around you and experimenting with ways to recover the rifle will add to your movement vocabulary and creates loose recoveries.